But after noting that these items allow kids with disabilities to see themselves in their toys, and help normalize differences for all children, Jezebel writer Dodai Stewart questions whether the company isn't focusing too much on "ultra-customization" -- instead of allowing girls to imagine themselves in a different time and culture. "Does it put too much emphasis on the individual?" Stewart writes. "Is it all connected to this new selfishness, the kind of parenting that insists every child is a special snowflake, worthy of praise just for existing? Huh?!! wrote Ellen at Love That Max this morning, which is where I heard about the story. Stewart continues: "It seems like, with the original history-oriented American Girl Dolls, the doll was a time-machine friend, the book taught a lesson, and you didn't have to be black to learn from Addy, the girl who escapes slavery during the Civil War." But Stewart then questions whether the custom dolls mean "there's less interest in exploring different cultures." News flash: Disability is a culture, an identity, a minority group that is devalued. Why does Stewart assume that only a girl who wears hearing aids or uses a wheelchair is going to purchase these accessories? What about the girl who hears fine but want to imagine, through her doll, what it's like to wear pink hearing aids and speak with her hands and her mouth? Isn't that the same as pretending you're the girl escaping slavery in the Civil War? For the first time millions of little girls (and boys) are going to be able to use their play in a way that opens up their minds to greater diversity. Every child is a snowflake, and the more we encourage kids to create stories and play about all variations of those intricately-patterned crystals, the better. There isn't anything selfish about that. I went to the AG store in NYC for the first time this summer. Wheelchairs were sold out! Sad for the friend I wanted to pick it up for but, something positive about their popularity. I love AG for offering this. I can't think of a single way this could not help our kids with their peers. And yeah, both my kids are special snowflakes too! 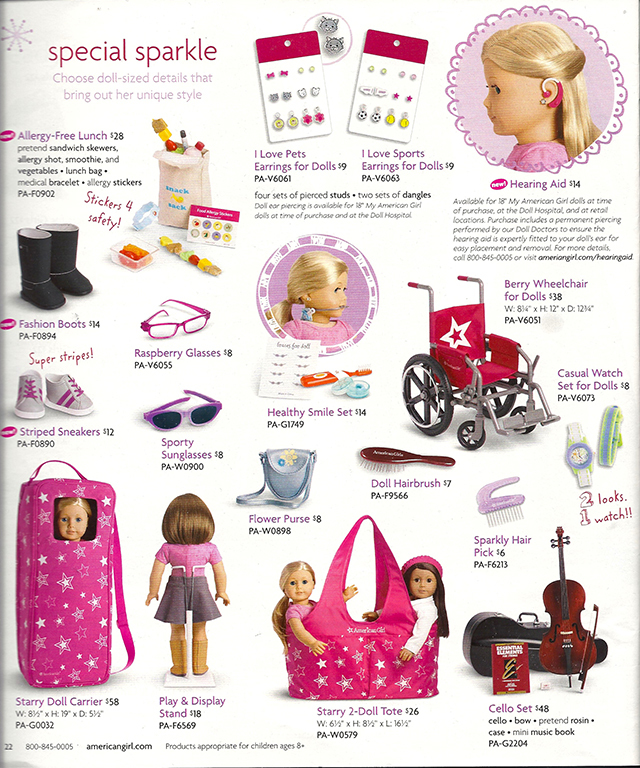 Love that a brand as popular as American Girl has included these 'accessories' for their dolls. Though they aren't accessories for our kiddos and I think that's the point. Brown hair, blonde hair, blue eyes, dark skin, light skin...you can't change that about yourself, nor can you anymore change hearing aids, cochlear implants, wheelchair, glasses etc. My daugthers CIs (cochlear implants) are a part of her. We actually call them 'her ears', they aren't an accessory and Dodai Stewart's comment is simply ill-informed (I'll refrain from calling it ignorant). Well said, as always, Louise. And I couldn't agree more: Every child is a snowflake. Mine is a snowflake who can't stop talking about Cars 2!!!!! I don't agree with the words of "Disability is a culture, an identity...", as I am first and foremost, "A human being." Yes, my disability forces me to think and operate beyond the status quo at times, but my passion, my intellect and the way that I love, is who I am. Although the creation of these dolls will neither guarantee acceptance or equality for those with special needs, it will assist typical parents and children to open their minds, as well as their hearts, to others. Thus, a courageous first step. As the mom of twins, one with a disability and one without - both in love with their American Girls, I can say that having the wheelchair truly makes our girls feel like their dolls are similar to them. They both use the wheelchair for their dolls and both dolls also walk sometimes. What's important is that their life is reflected in these great toys and therefore, they relate on a whole new level! Bravo AG!! Hi, Louise! I had to check this post out because my two older girls love AG. They were thrilled to see the various accessories that remind them of their sisters. As much as the AG industry is too expensive for my taste (the girls' items have been gifted to them), I appreciate their willingness to consider real accessories for real kids. One of their recent movies, McKenna, included a subplot that attempted to shed light on what it is like to use a wheelchair - from a girl's perspective. No movie or product is perfect, but I can appreciate the intention behind the concept.